Click image to enlarge Interstate 84 at Wyeth, Oregon. View looking west. Image taken October 2, 2006. 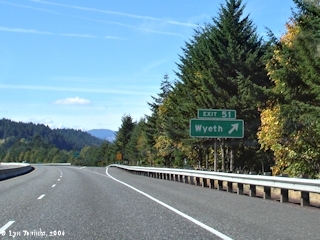 Wyeth, Oregon, is located at Columbia River Mile (RM) 156, upstream of Cascade Locks, Herman Creek, and Government Cove, and downstream of Shellrock Mountain. Wyeth was a railway station and was named after Oregon pioneer Nathaniel J. Wyeth, builder of Fort Hall (today's Pocatello, Idaho) and the Fort William trading post on Sauvie Island. In the 1930s the Wyeth area was a CCC camp and in the 1940s it was a Conscientious Objector camp. Today Wyeth is part of the Columbia Gorge National Scenic Area. It hosts the U.S. Forest Service Wyeth Campground (seasonal) and the Wyeth Treaty Fishing Access Site. 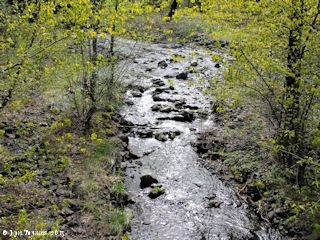 Gorton Creek and Harphan Creek are located at Wyeth. Gorton Creek enters the Columbia River at River Mile (RM) 156, is 2.5 miles in length (mostly perennial) with its mouth being an impounded pond formed by railroad fill. The Wyeth Campground borders its right bank. Less than 1/2 mile upstream is Harphan Creek. 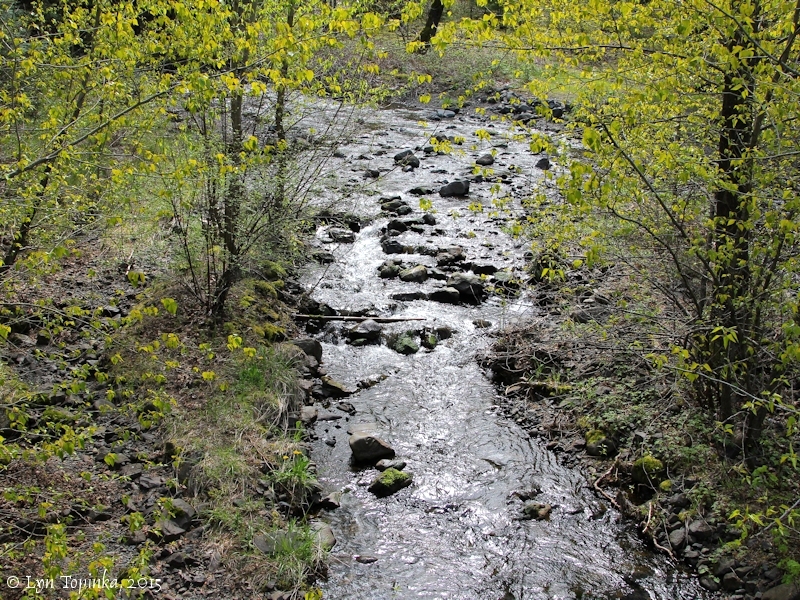 Click image to enlarge Gorton Creek, looking upstream, Wyeth, Oregon. 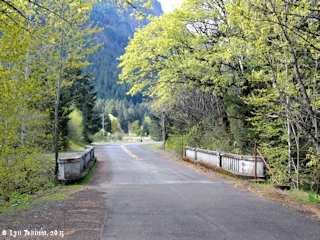 View from Historic Columbia River Highway Bridge over Gorton Creek. Image taken April 9, 2015. "... Oregon has seen fit to honor one of her notable explorers by attaching his name to a post office and a railroad station that achieved fame largely because it was for some years the site of a "tie pickling plant". The post office ran with one interruption from 1901 to 1936. ..."
Nathaniel J. Wyeth let two expeditions to the Pacific Northwest, the first in 1832, and the second in 1834. Wyeth's purpose was the establish a fur trapping business. Between 1834 and 1835, Wyeth built Fort Williams on Sauvie Island, Oregon, in an attempt to establish a fur-trading enterprise in Hudson's Bay Company territory. The Fort was constructed on the island near the confluence of the Willamette River with the Columbia, about five miles from Fort Vancouver, and named for one of Wyeth's fur trade partners. Wyeth was unable to get a foothold into the Hudson's Bay Company trade and he abandoned the project in 1836. 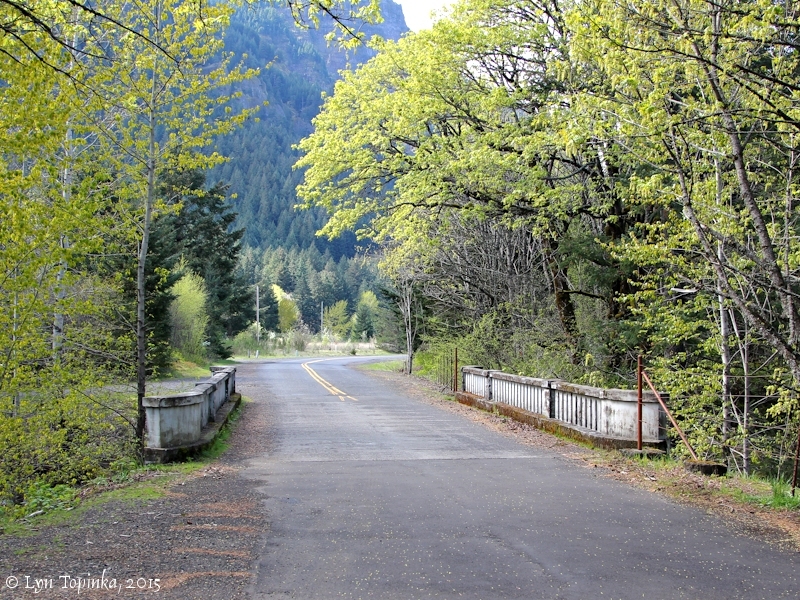 Click image to enlarge Gorton Creek Bridge, Historic Columbia River Highway, Wyeth, Oregon. View looking east. Image taken April 9, 2015. 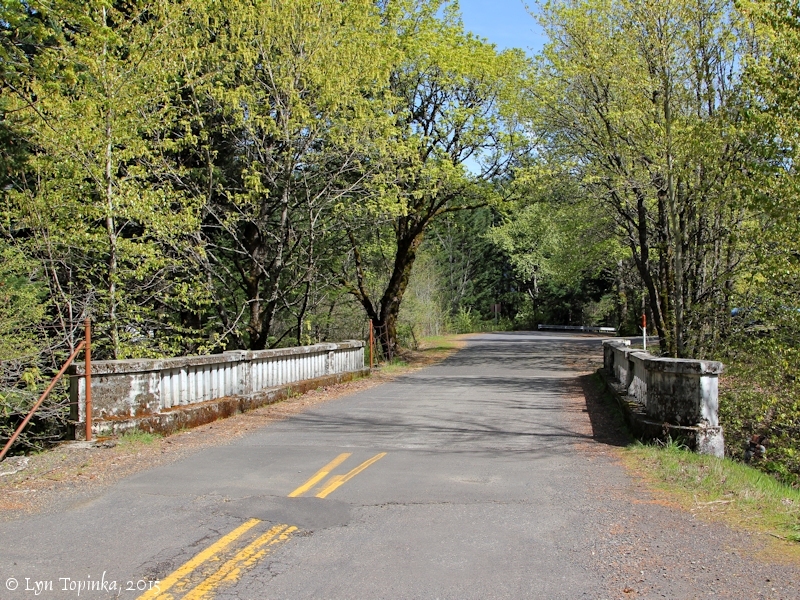 Click image to enlarge Gorton Creek Bridge, Historic Columbia River Highway, Wyeth, Oregon. View looking west. Image taken April 9, 2015. According to the U.S. Forest Service, "The Wyeth area was an early settlement site and was later used as a CCC camp in the 1930s and a Conscientious Objector camp in the 1940s.". Click image to enlarge Wyeth Campground, Wyeth, Oregon. Image taken April 9, 2015. 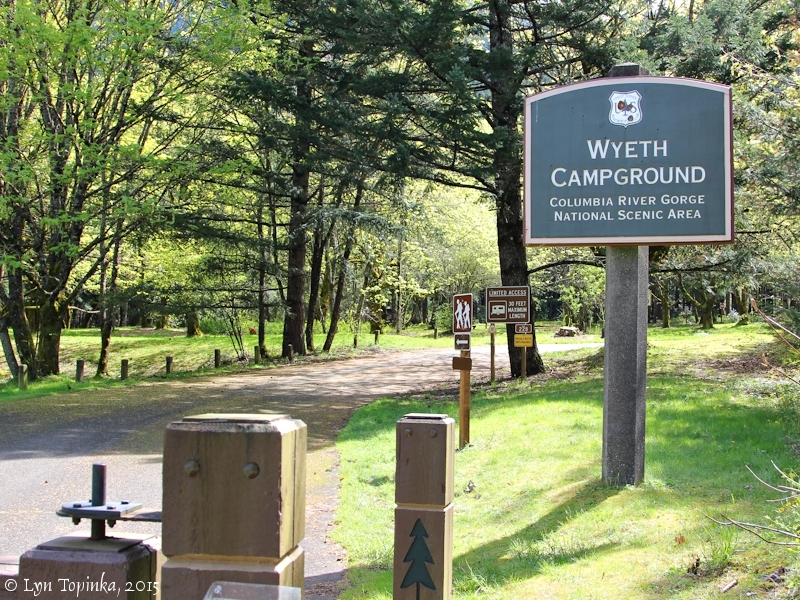 Click image to enlarge Wyeth Campground, Wyeth, Oregon. Image taken June 24, 2015. 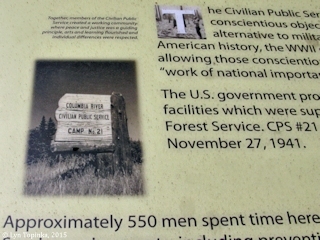 Click image to enlarge Information sign detail, Civilian Service, Wyeth Campground, Wyeth, Oregon. Image taken June 24, 2015. 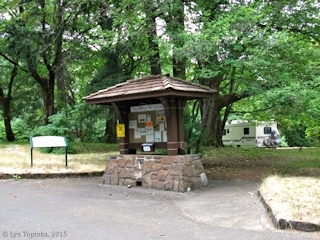 Source: Information Sign, Wyeth Campground, visited June 2015. Wyeth was the location of a Civilian Conservation Camp (CCC) known first at Camp Wyeth (F-7) and later as Camp Cascade Locks (F-7). Camp Wyeth was established in the summer of 1933 as the Civilian Conservation Corps (CCC) camps began. 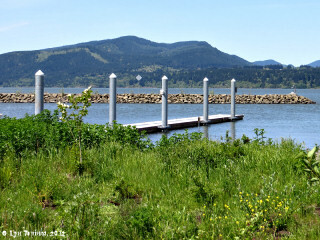 The camp closed for the winter in October and then opened again in the spring of 1935 as "Camp Cascade Locks". Another CCC camp, Camp Latourelle, was established 26 miles downstream. This camp was a "summer camp" and existed through the summers of 1934 and 1935. The enrollees of these camps worked on road construction, roadside clearing, campground development, construction of trails, and general building projects. Camp Wyeth/Camp Cascade Locks was abandoned on November 15, 1941, making it one of the longest occupied Oregon CCC camps (Camp Zigzag, located near Mount Hood, was the longest, occupied from 1933 through 1942.). "Camp Wyeth was originally established and operated in the CCC's first enrollment period during the summer of 1933. The first company at Camp Wyeth was No. 606, made up of junior enrollees from Illinois ... Carroll E. Brown, a locally enrolled foreman at the camp, noted Camp Wyeth was located about 5 miles east of Cascade Locks. 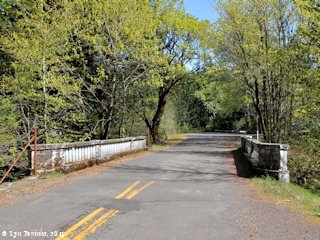 Brown worked under Project Superintendent Rudy Tohl and assisted with various road, trail, and campground construction projects. The camp was one of six CCC camps on the Mount Hood National Forest sent to help fight northwest Oregon's Wilson River Fire, or Tillamook Burn, in August 1933. In October 1933, F-7 closed for the winter, and Company 606 moved to California. The camp's frame-constructed buildings were rated from good to excellent in early 1937. They were reported to have commercially powered lighting and adequate wood heat. All buildings had been insulated from the winter weather with Celo-tex. Food supplies were obtained locally or from Vancouver Barracks, WA. In December 1937, Company 1452 occupied F-7 ... The 159-man company was made up of enrollees from Tennessee, Alabama, Georgia, Louisiana, North Carolina, and South Carolina. Their primary tasks were to develop the Eagle Creek public campground, lookout stations, and parking area on the Columbia River Highway near Bonneville Dam. ... According to Inspector M.J. Bowen, heavy, continual rainfall was lowering the morale of enrollees, none of whom was accustomed to Oregon's winter weather. By February 1940, 191 men belonged to Company 1452 ... Construction projects were of the same types as previously undertaken. Some 2,012 man-days had been lost over a 3-month period. Camp services were all rated as good to excellent, except for an undersized, inadequately furnished recreation hall rated as "poor." Camp F-7 was abandoned on November 16, 1941. Its rigid-style buildings were left in Forest Service custody." 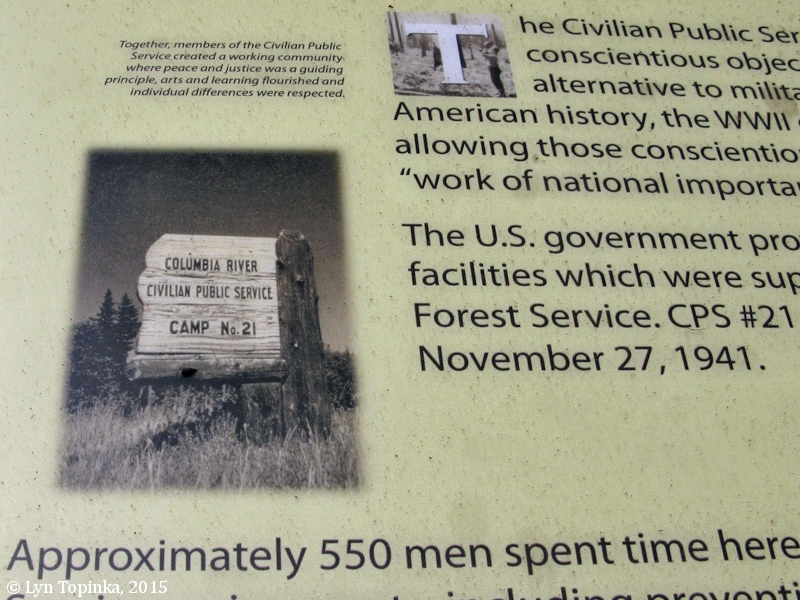 During World War II, Conscientious Objectors through the "Civilian Public Service" (CPS) program, resided at "Camp #21", occupying the abandoned CCC "Camp Wyeth" grounds. One of the most notable CPS camps was right here in Oregon in the Columbia Gorge. On Dec. 5, 1941, two days before Pearl Harbor, 71 conscientious objectors, nearly all from California, arrived by train at CPS Camp #21 at Cascade Locks to begin their alternative service, expecting to serve for a year. After the U.S. entered the war, their term of service became the duration of the war plus six months, the same as those in the military. Eventually, the camp, which was actually seven miles east in Wyeth, housed nearly 200 men, who, despite long hours of physical labor on work projects for the Forest Service, were able to build a vibrant pacifist community that came to be known as the "Athens of CPS." About 550 men spent some time at Cascade Locks during the war. " Source: Jeffrey Kovac, 2009, "WWII pacifists served, too, in Oregon", "Oregonlive.com" ("The Oregonian") website, 2015. At Wyeth's Station J.F. ELLIOTT, Prop. Source: Ad appearing in "Official Columbia Highway Tour", 1916, Published by The Scenic Tours Company, Portland, Oregon. Construction began in 2010 and finished in 2011 on the Wyeth Treaty Fishing Access Site. 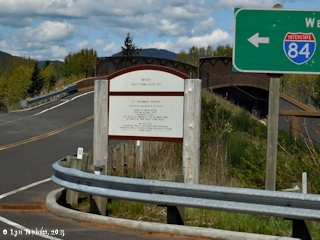 The site helps fulfill a treaty made with Native Tribes for 400 acres of Columbia River fishing, a treaty made in the late 1880s and interrupted by the building of the Bonneville Dam. By Duran Bobb, June 2, 2010, Spilyay Tymoo, The Newspaper of the Warm Springs Indian Reservation. "Construction began last week on the Wyeth Columbia River treaty fishing access site, located between Hood River and Cascade Locks. The $8 million in-lieu project is expected to be finished in late summer of 2011. The Warm Springs, Yakama, Umatilla and Nez Perce tribes attended the Wyeth ground-breaking ceremony on May 27, hosted by U.S. Army Corps of Engineers. "This means that there will be more fishing sites for our Indian people," said Chief Delvis Heath. At the ceremony, tribal and federal representatives signed the construction labor agreement with Corps of Engineers. The new fishing site is to mitigate the loss of tribal fishing sites decades ago. "They originally promised us 400 acres of in-lieu fishing sites, but we only got 40 acres," Chief Heath said. "So we went back to them in 1988 to remind them of the promises that were made to our people. They put the Army Corp of Engineers in charge, and now they’re finally fulfilling their promises." Col. Steven Miles said that he looks forward to a future of cooperation with the Columbia River tribes. "This is one step toward making sure that we can maintain a healthy relationship with the tribes," he said. The Columbia River treaty fishing access site (CRTFAS) is an authorized project for the mitigation of lost tribal treaty fishing access resulting from construction of the Bonneville Dam. Project elements include roadway design, a bridge over the Union Pacific Railroad tracks, marine structures—including a boat dock, a boat ramp and breakwaters—vault toilets, and campground facilities. After signing their treaties in the 1850s, the Columbia River tribes were guaranteed their right to fish at the usual and accustomed fishing grounds along the river and its tributaries. In 1889, Indian agent George Gordon investigated claims that the treaty tribes were being excluded from their fishing grounds. As the result of actions that followed, the tribes’ treaty-protected rights were firmly established as a matter of law. Construction of dams on the river resulted in more loss of tribal fishing grounds. In 1940, the Army Corps of Engineers was directed to acquire 400 acres of lands along the Columbia River and construct facilities for use by the treaty tribes. It took almost 20 years to acquire five sites. In 1988, the tribes suggested several sites which were already being used by tribal fishermen. The Army Corp of Engineers was provided with authority to acquire at least six additional sites adjacent to Bonneville Pool from willing sellers. "They say they’re almost done," Chief Heath says. "They’re coming to the end of the 400 acres… They purchased a lot of land, but I think most of it is way above, and not in the Bonneville pool. But at these sites, we don’t share with outsiders." Chief Heath said, "These are made just for our people, as compensation for what was lost when the dams were built. They need to let people know that this is an In-Lieu Fishing Site." 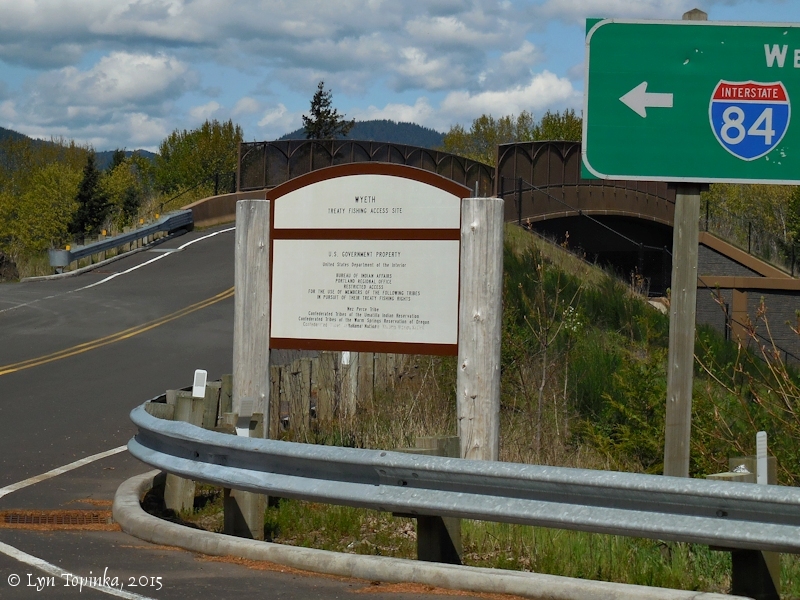 Click image to enlarge Treaty Fishing Access Site sign, Wyeth, Oregon. Image taken April 9, 2015. 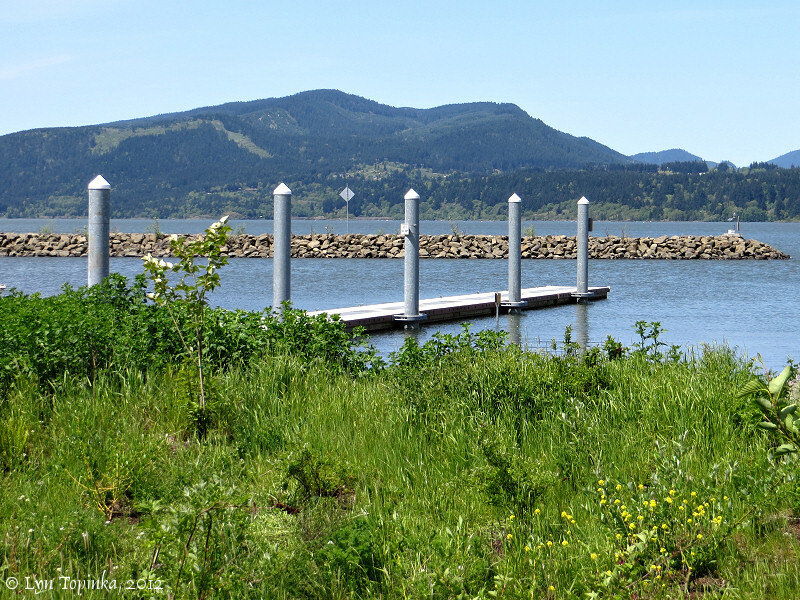 Click image to enlarge Columbia River as seen from Wyeth, Oregon. View looking north, towards Washington State. Image taken May 11, 2012.